1. Breakfast Yay or Nay? Always yes to breakfast. These days that is vegan food only though, also Cheerios, oats, fruits. Along those lines. 2. Big cats or small cats? Anyone who has been to Precision’s Trini studio has met Daisy, our house cat. So small cats. 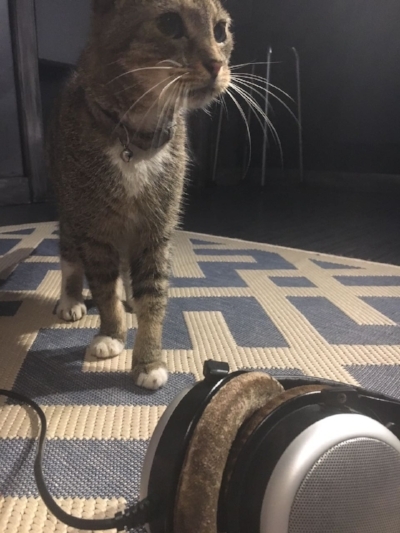 Daisy in studio giving her feedback on the new Precision tracks. 3. Socks with slippers? Or Socks or slippers? Honestly…I do socks with slippers, but also just slippers. Whatever is easier and most comfortable in the moment. 4. Is it Bake and Shark or Shark and Bake? 5. Team Jay Z or Team Kanye for a collaboration and why? Jay Z will forever be the boss. Always. But Team Kanye I feel. Hearing what he will do to a basic soca beat will be insane.